Clinton County Reads 2019 culminated Thursday evening with the annual Clinton County Reads dinner and program at the General Denver Hotel. This year’s community read was Tara Westover’s bestselling memoir, “Educated.” Kerri Shaw, who teaches social work at Ohio University, connected her own experiences in Appalachia and as a Peace Corps volunteer in Paraguay to the book’s themes of geographic and social isolation. 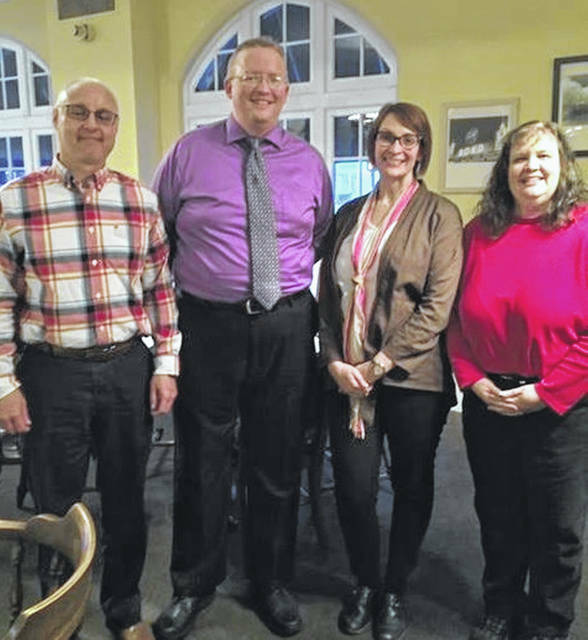 Pictured, from left, are CCReads Steering Committee Chairman and Blanchester Public Library Director Chris Owens, Wilmington Public Library Director Joe Knueven, guest speaker Kerri Shaw, and Sabina Public Library Director Peggy Dunn. Clinton County Reads is sponsored by the public libraries in the county and local bookseller Books ‘n’ More.